Some times at least some of a family’s story can be pieced together from plain old boring documents, like census and parish register information. From names and dates, a vivid picture of lifestyle and character can emerge. One such story from my family is that of my 3rd great grandmother on my mother’s side, Ruth Cam. The facts tell me that Ruth was christened at the Yate Parish church St. Mary’s in Gloucestershire, England, on 14 June 1805. She was born the second of five children, the first daughter of William and Mary Cam. Her older brother, Robert, died when she was a year and a half old. In 1829 at the age of 24 she had a daughter, Harriet, and in 1832 she had another daughter, Mary. In their baptismal entries in the Yate Parish registers, Ruth Cam’s occupation is listed as “spinster”. Two years later, on 22 Oct 1834, Ruth Cam married by banns in Gloucester, Charles Stoneham, a widower. Charles Stoneham was baptised 13 Nov 1785, in the Yate parish church. He was the son of John and Mary Stoneham. Charles and Ruth Stoneham had five children, all baptised at the Yate parish church: Frances, bp 11 Jan 1835; Charles, bp 5 Nov 1837; Sarah Ann, bp 1 Mar 1840; Ruth, bp 11 Sep 1842; and John Cam, bp 13 Apr 1845. In the 1841 census of Yate, Charles Stoneham’s listed address is Stansha we Farms, where his occupation is listed as farmer. He is living with his wife, Ruth, stepdaughter Mary, and their children Frances, Charles and Sarah. Also listed at that address are three servants – John King, George Ball and Mary Williamson. The next residence listed in this census is at Stanshawe’s Court Farm wherein resides Ruth’s parents, William Cam, Farmer, and his wife, Mary, their children John and Jane and one servant, Samuel Wilkins. Just two years after their last child was born, Charles Stoneham died, on 2 Oct 1847. The coroner stated on his death certificate that he “Died suddenly by visitation of God”. In the 1851 census at the age of 46, Ruth is listed as the head of household at Stanshawe Farm. Her occupation is listed as “Farmer of 140 acres employing 4 laborers”, two of which were probably her sons, as there are only two additional “farm servants” listed in the household. She still had six children at home ranging in ages from 6 to 18. Her father, 76, was still a farmer at nearby Stanshawe Court Farm, but now of 28 acres. In the 1861 census Ruth is 52, and listed as the “Farmeris of 190 acres of land employing 2 men and 2 boys”. With her are sons Charles, 23, and John, 12, and daughter Ruth, 18, along with one servant. In 1871, her age is listed as 67, and Ruth is still the farmer of Stanshawe’s Farm, but now of 200 acres, employing 3 men and 2 boys. Her sons Charles, 33 and John, 26 are still living with her and are listed as “Farmer’s sons”. In 1881 at the age of 78, Ruth and her two yet unmarried sons Charles, 43 and John, 36, are found in the census records at the address of the Rectorial Farm at Wapley and Codrington, in Chipping Sodbury. She is listed again as “Farmer”. The 1891 census lists Ruth Stoneham, age 87, Farmer, at the address of Dean & Chapter Farm in Wapley & Codrington, another name for the Rectorial Farm there. Son Charles, 53 and still single, resides with her along with one servant, and her son John, 45 and also single, is listed at the next successive address, given as Osland’s Farm, where he is the sole resident and occupation farmer. Ruth Cam Stoneham passed away from a “Decay of Nature” at the age of 90, on 16 June 1895, in Codrington, Gloucester, England. Those are just the facts. But can you see the story? Ruth Cam had two illegitimate daughters before marrying a man 20 years her senior. Unfortunately the facts don’t tell us the story around that – Was she a beauty? Was she the town, um, you know…? Were they madly in love? Was it a marriage of convenience? It seems to me that they were both success driven people, and determined to work hard together. Charles became a successful farmer, responsible for the Stanshawes farm on Stanshawes Manor, which was one of the three main manors of Yate. 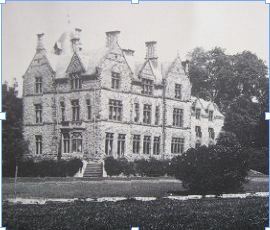 The manors included considerable acreage of land. Charles Stoneham was listed as “yeoman”. According to wikipedia, “The ‘yeoman’ would be the connection between royalty and nobility to the peasantry, thus a middling class of sorts in feudal or manorial service to either the king, or a lord. Yeoman farmers were originally a class of British or English landholding (freehold and copyhold) farmers in the late 14th to the 18th century. Ruth’s husband died when she was 42, leaving her with with six children – five under the age of 13, the youngest being barely two years old. Obviously a woman of strength, she picked up where her husband left off and continued running the manor farm, with the help of her sons. 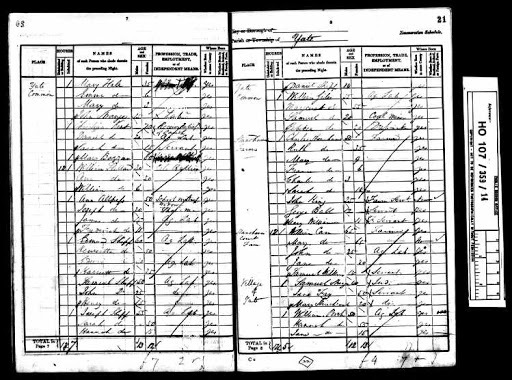 Perusing census records, it is common to find sons running the family farm, and the mother listed with no occupation, or that of housekeeper. But not this family. Ruth continued to be the Farmer or “Farmeress”until she was nearly ninety years old. Her sons must have loved her, as they spent the majority of their lives at her side. I wish I could have known her, or been able to talk to someone that knew her personally. I would love to know more details of her life. But fortunately the facts help create a fairly clear picture of her strength and determination. Welcome to the Geneabloggers family, just as I was recently added 🙂 What a great story! I love the death certificate that said he died from “visitation of God”. What a great way to go, no? Can you imagine being so strong & fearless? I think that it is this type of character & quality that makes these women the most beautiful! 🙂 Thanks for sharing! Wonderful stories, Tami! I love your new blog. “Died suddenly by visitation of God”..?? Gotta love that one! Thanks for sharing it. I love the two causes of death – decay of nature and visitation of God. We’ve had a yard – not a farm – of only one acre and I had a hard time managing that. I can’t imagine being a farmer at the age of 87! Ruth certainly qualifies as a strong woman! Both a farmer and an employer! She did well – and I’m sure it wasn’t easy. No doubt there’s still more to the story, and wouldn’t it be a fascinating one!! I enjoyed reading your post – the Facts about Ruth followed by “The Story Emerging”. The death certificate detail of “Visitation by God” and “Decay of Nature” added a colourful if macabre note. I had a similar situation in my family where my great great grandfather, widowed with five daughters, married someone 20 years his junior with three illegitimate children – and went onto father four more. with his second wife! I love this story. 🙂 Ruth reminds me of my 3rd great-grandmother who bought and sold a lot of real estate, except that she wasn’t widowed with a lot of children to take care of like Ruth. Ruth showed in her life that women were not brainless, as was often believed of women in general. Thanks for sharing this story.